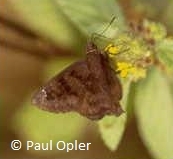 Identification: Upperside is mottled black; forewing has tiny white subapical spots. Life History: Females deposit eggs on the upperside of host plant leaves. Flight: October-November in South Texas; July-November in Mexico. Habitat: Tropical, usually in lowlands. Range: Brazil north through tropical America to northern Mexico. Occasionally strays to the lower Rio Grande Valley, Texas.